Project Life: Week 5 | I am JuJu! I can’t believe it is already time to post my project life pages. Last week was a crazy week! It started off well and then I was hit with a bout of vertigo. Things were spinning for a couple of days, but I’m feeling much better. I absolutely love documenting our everyday life this way. 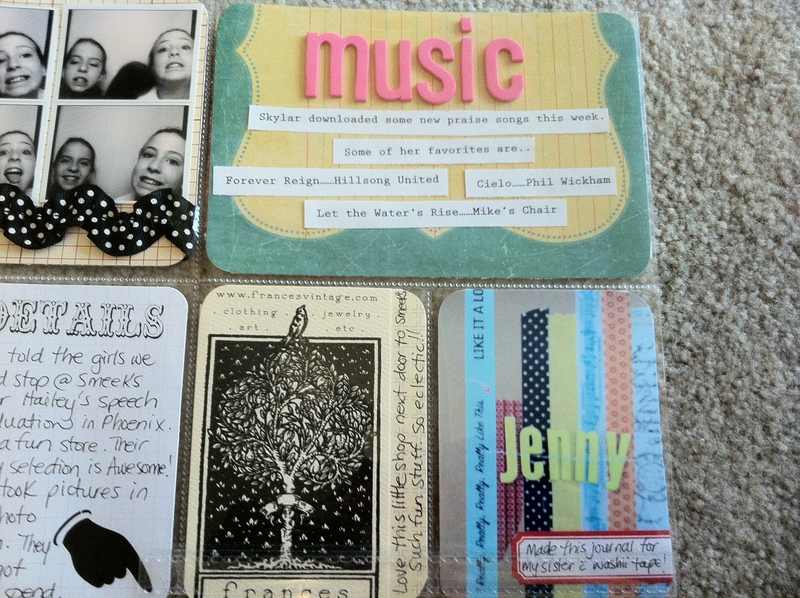 It takes a lot of the guess work out of scrapbooking, but also allows me to add my own flair & style. 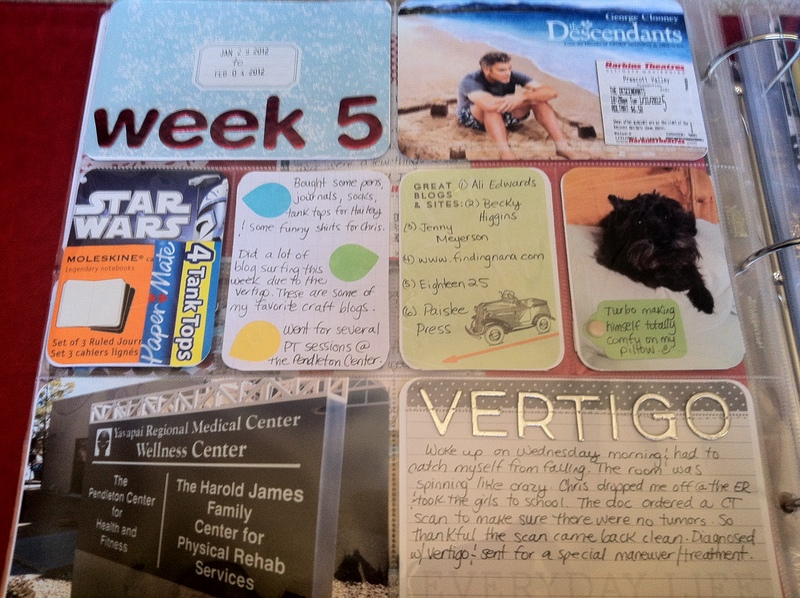 Five weeks into using project life, I am definitely in the habit of keeping receipts, tags, movie stubs, etc. to add to my album. I LOVE adding that extra stuff. This week I didn’t take as many pictures, but I had quite a bit of “extras”. This was by far the most fun I’ve had assembling my pages. Below is my layout, not including the 6×12 insert I added. Below is the left page. I continue to love including a picture of the movies I watch along with the movie stub. The past couple of weeks I have enjoyed seeing a matinee movie after I drop the kids off at school. I’m thinking it should become my new weekly ritual! I also included a journaling card telling about my issues with vertigo this week as it was a pretty big part of the week. Being pretty limited with what I could do for the latter part of the week, I did a lot of blog surfing. 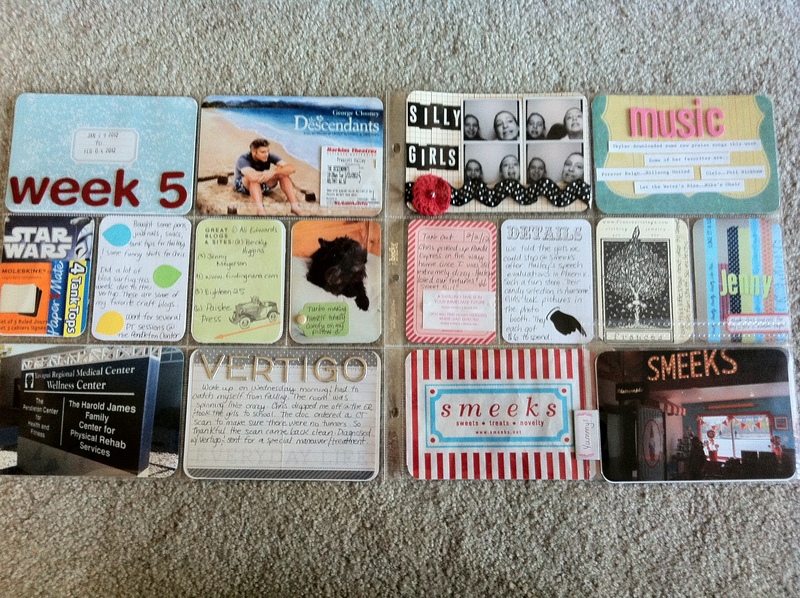 I shared some of my favorite craft/creative/story telling blogs on the “Great Blogs & Sites” journal card. The card came out of a Smash journal pad I picked up at Michael’s. Below is the right side of my layout. I loved adding the pictures of my girls in the photo booth. I used one of these 4×6 flip up protectors. 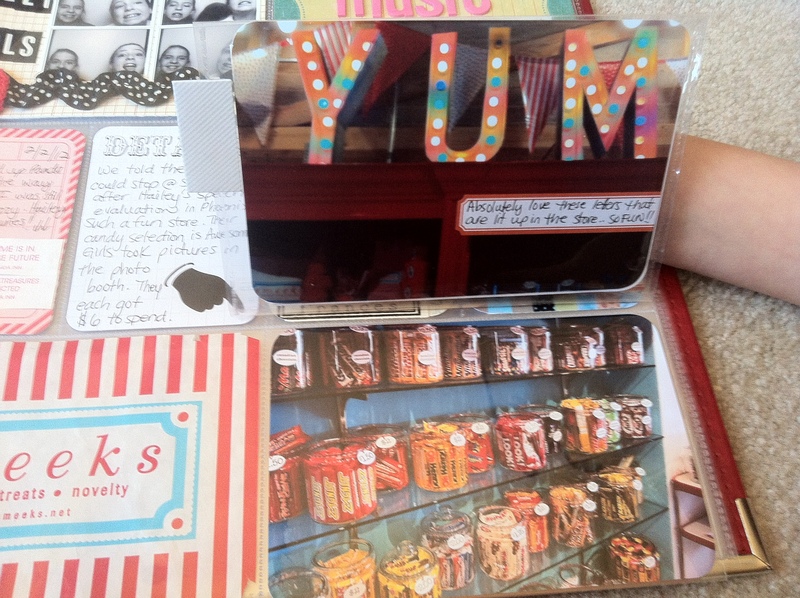 I love how that little section tells the story of our trip to our favorite old-fashioned candy shop in Phoenix, Smeeks. I used some rub-ons that I’ve had for a long time on the journal grid card. I also added the fortunes from our takeout food this week to a journal card. Hailey loved them & can’t wait for the thrilling times & the treasures that lie ahead! I wanted to document the songs that Skylar has been listening to a LOT this week. I love that she loves to listen to Christian music or “Jesus music” as she calls it. I also included a picture of a journal I made for my sister. It is a moleskin journal (sold in packs of 3) from Target. I added some washii tape, letters, & stitched across. This literally took me 4 minutes to make. She loves to make lists & I thought it would be a perfect place for her to keep them. 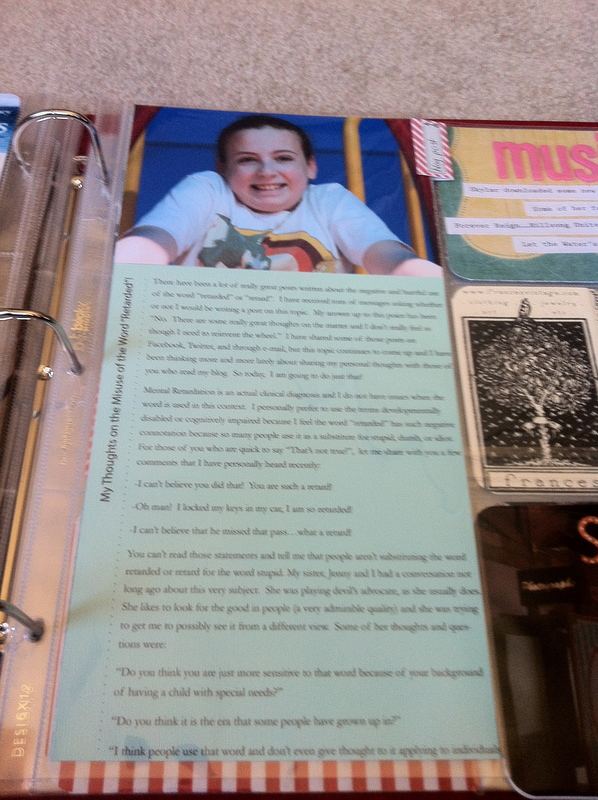 I used this 6×12 journal template by Ali Edwards to include a blog post that I wrote this week about the misuse of the word “retarded”. You can read that post here. The journaling continues on the back of the page. I will never stop trying to get people to stop misusing that word. Well there you have it! 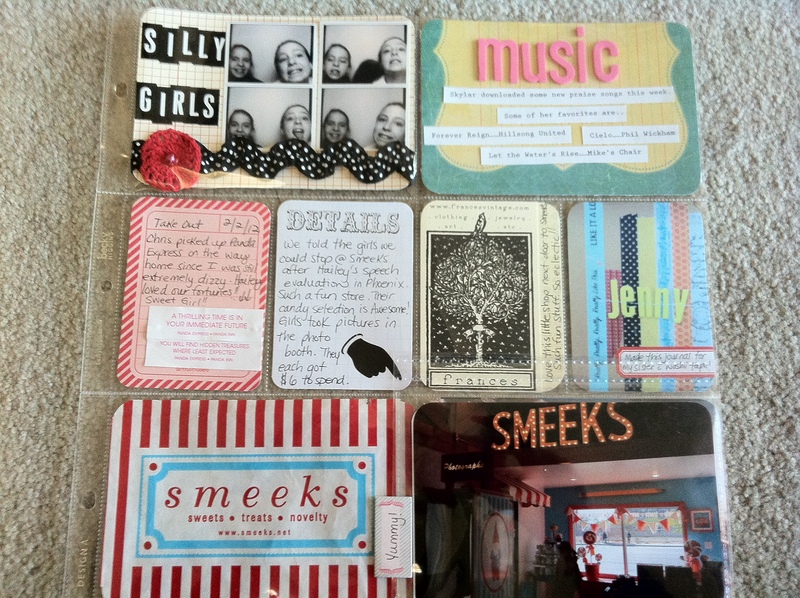 I am linking up again with The Mom Creative and her project life Tuesday group. I have really enjoyed visiting other people’s blogs and seeing their take on project life. I have even made some new friends along the way! Make time this week to document your story, it is so important! This entry was tagged project life week 5. Bookmark the permalink. Thanks Jessica! I loved adding the flip up protector & the candy store was SO much fun!! Thanks for stopping by! That’s a great idea – the photo of the movie with the movie ticket stub! And the journal you made for your sister turned out super cute. I’m sure she’ll love keeping her lists in there! Thanks Jules! I wanted to keep track of the movies that I saw this year & thought that was a good way to do it. The journal was super fun & super easy to make. I also made one for myself & I’ve been using it like crazy. Thanks for stopping by! I love all the colors you use and how you make your pages so unique and personal to your family! Love the extra 6 x 12 page! and the flip up protector is really awesome!!! Thank you Jenn! I love the 6×12 protectors too. I’ll definitely have to buy more of those when they are back in stock. It was my 1st time using the flip up protector, but I’ll definitely be using those more often! really and truly beautiful pages. Your mix of type on photos and thickers and ephemera looks amazing. Thanks for sharing! Thank you so much! I’m so enjoying mixing things up! Thanks for stopping by! Love your pages. I had a friend years ago who struggled with vertigo. Challenging, to say the least. Love your silly girl pictures. SOOO fun! And the SMEEKS photos! Yummy! Thanks Cami! The silly girl pictures are my favorite! I’m feeling so much better, but the vertigo was extremely challenging for sure. It makes me thankful for my health! Thanks for stopping by! I really like the look of you pages this week. You have put all of the extras in well – it doesn’t come naturally to me to stick the bits and pieces in. Hi Sharon! I think adding the extras in gets easier as you go along. I’m definitely already more mindful of keeping things now than I was even 5 weeks ago. The photo booth pic was one of my favorites from the week. The Descendants was an interesting movie. I thought Clooney was good. It is super heavy material. I’m going for a happier movie this week or at least action packed! 😉 Have a great week! Wonderful layout for week 5! Love the details. Thanks Jill! I’m enjoying adding the little details. It is definitely feeding my creative spirit! Thanks for stopping by! great pages…LOVE the flip up candy part 🙂 “Jesus Music” Rocks! Thanks April! I’m loving the flip up protectors. I look forward to using those again. And Jesus music most definitely rocks!! Thanks for stopping by! I love your pages. And I completely understand how debilitating vertigo is. I hope you are feeling better. Thanks Gina! I’m feeling much better. So happy to be steady on my feet & no longer nauseous. Thanks for stopping by! Thanks Joy! Love you my friend! Another brilliant week! You are so creative. I love every aspect of your pages. I can’t wait to see your year unfold! Thank you so much Sarah! I’m so enjoying this project & documenting our happenings. It is truly feeding my creative spirit! Thanks for stopping by! Thanks for sharing that information Kate! Vertigo is truly debilitating. I had several treatments (maneuvers) & that helped tremendously. I started taking a magnesium drink so that should help as well. Hope you have a great week & thanks for stopping by! Great pages, I am glad you wrote about the misuse of retarded. As a special ed teacher, I dealt with that a lot. I also enjoyed seeing the journal you made…just saw those moleskins at Target and literally squealed in the aisle. My husband was soooo embarrased. The photobooth pics are great too, add a lot of interest to your page. Thanks Katie! I hate the “R” word because it is misused so often. Thanks for all you do for your students! I enjoyed making the journal for my sister. I squeal often in the store when I’m w/my hubby….he’s used to it now. Holy cow, I´m in love with your pages! Your style is so much fun and all these detail make me swoon! I wish I could get me some of these flip pockets in germany – I´ve searched for them, but no way. 😦 Love the look of it in your album! TFS! Your pages are so thoughtful and pretty. Thanks for sharing. 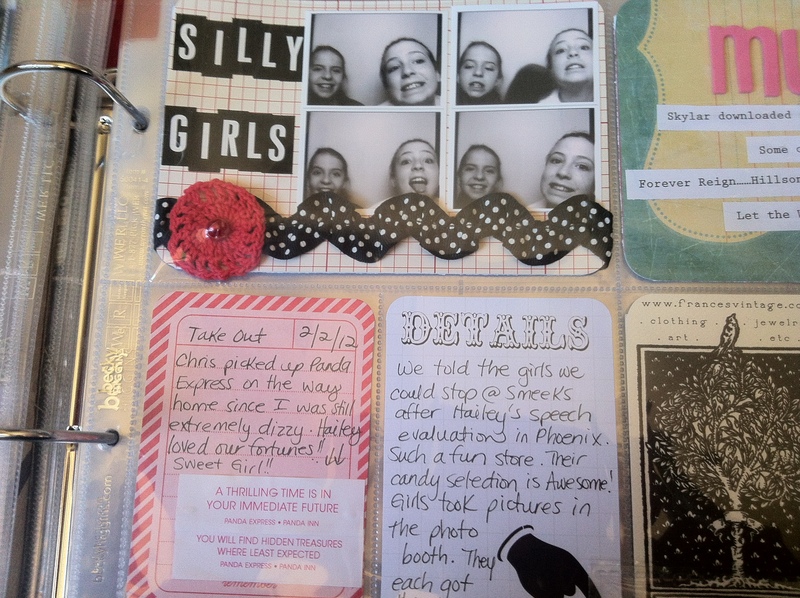 I love that you use the flip pockets and include blog posts in your album. I may have to try that out as well. Thanks Christina! I love the flip up pockets & I love adding a blog post each week. My hubby just told me that he loves that I add that. Thanks for stopping by my blog today. Have a great night! LOVE your pages, Julie! Love that flip up page and the use of the 6×12, too! Great job! Thanks for linking up on my blog! Fun pages! I included The Descendants this week too. Loved it! I love the colors on your pages! They look so sweet and yummy. Beautiful pages. OOOH love the flip up protector, so going to have to try that one. Love all the colors in your pages! I also love how you used the vertical photo page protector on the right side…I think I’m going to try that!!! love your layout this week, the colors are great the pictures are great, it is all great. Where do you get your Martha Stewart labels from? and where do you get the little flip up protectors from? Conni…I got my Martha Stewart labels from Staples. They are part of her new line for them. I got the flip up protectors through c-line. You can get them through Amazon. I have a link in my post that will take you directly to the site.